The core of this problem is the body’s own over-enthusiasm to protect itself. Whenever stress levels become overwhelming, whether from emotional stress at work, the loss of a job or loved one, financial stress or overexertion from exercise, the body triggers a cascade of signals to the immune system which goes into overdrive to protect itself. 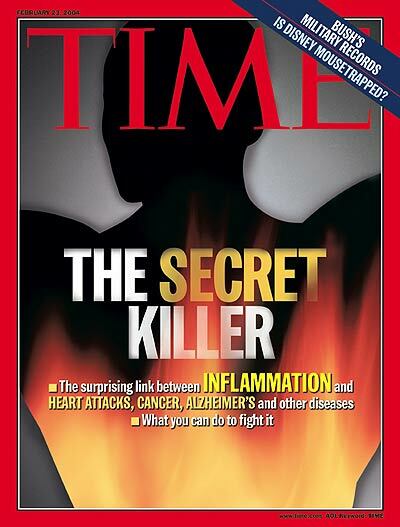 When this continues day in and day out, inflammation explodes and becomes like a forest fire in the blood and tissues. That’s why doctors are baffled in treating it, drugs have no answer anyway. What we theorized is that if this condition is like a “fire”, why not use Mother Nature’s own “fire extinguishers” that work naturally to put it out? So, we poured over hundreds and hundreds of research reports and a clear picture was revealed of how to do it. And it works so well that it literally feels like you’ve “Turned BACK the Hands of Time” by putting out the fire and stopping (and potentially even reversing) the aging process. Controlling this “overactive response mechanism” and doing it naturally without drugs, has immediate results. Some people just naturally have this high stress/trauma condition under control. I believe that lifestyle and a strong spiritual belief is a major reason. We’ve all seen and know people who are in their 60’s, but they look 10-15 years younger. In fact, a woman in our church is 70, but could easily pass for 50! If you ever meet the Dali Lama, you’ll instantly remark of how “ageless” he looks. His serenity is more than skin deep. It’s the result of a strict adherence to the highest spiritual-value herbs in the universe, many of them unknown (until now!) here in the West. Holy Basil – considered a spiritual mood enhancer in India, this herb has layers of effectiveness including supporting healthy blood sugar levels and carbohydrate metabolism. It also has various neurotransmitter-modulating effects along with having analgesic properties and anti-stress effects. Resveratrol (Polygonum Cuspidum) – the miracle discovery to fight aging, especially in the skin and the brain. In a recent medical journal article, the conclusions were that Resveratrol as derived from Polygonum Cuspidum extract, has a comprehensive suppressive effect on oxidative and inflammatory stress. Ginger Root Extract – one of the greatest fire-fighters in natural medicine, amazing pain-relieving action. Boswellin – known, revered and utilized by Ayurvedic medicine healers for thousands of years for its anti-inflammatory and pain-relieving actions, with no side effects except relief. Bromelain – another one of Mother Nature’s “unsung heroes” in the pain relief medicine cabinet. Green Tea Extract – apart from providing instant, natural energy production, Green Tea is also a superb antioxidant to support aging by scavenging free radicals that cause damage to the cells. According to a major university database notes green tea contains 51 phytonutrients that promote a healthy inflammation response. Baikal Skullcap – a rare Mongolian herb used for centuries that according to Traditional Chinese Medicine (TCM) tradition drains heat from the body, thus eliciting an anti-inflammatory effect. Recent studies suggest the healing properties are attributed to Baikal’s high flavonoid content. Berberine – long used as a remedy in China and India for combating infections, Berberine contains powerful anti-oxidant capabilities, boosting immune system response. Turn off the “Aging Clock” and get near instant pain relief without dangerous drugs or side-effects through Mother Nature’s Fire Extinguisher! Age-Less Rx can be taken daily for the support of general and vascular health, or occasionally to alleviate aches and pains associated with stress or overexertion. Retail priced at $38.95, Preferred Members always save 30% at $26.97. Age-Less Rx has such profound, total effect that I think everyone should include it in their daily nutrition program. Limit caffeine from coffee to one cup a day. Eliminate red meat and BBQ ribs, they are high octane foods. Switch to fruits and nuts for your snacks. Make up my Miracle Potassium Broth soup and have a bowl every day. This is an amazing “soup of life”.